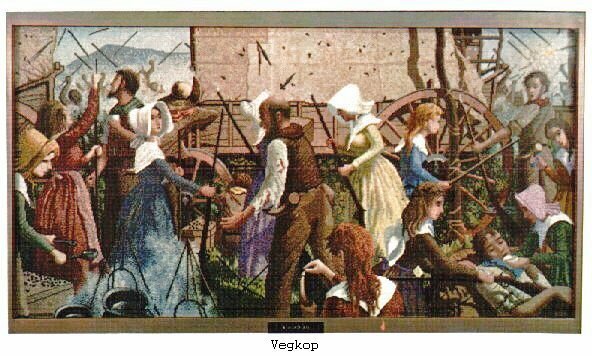 The Voortrekkers Afrikaans and Dutch for pioneers, literally "those who pull ahead", "fore-trekkers" were emigrants during the 1830s and 1840s who left the Cape Colony ,British at the time, but founded by the Dutch, moving into the interior of what is now South Africa. The Great Trek consisted of a number of mass movements under a number of different leaders including Louis Tregardt, Hendrik Potgieter, Sarel Cilliers, Pieter Uys, Gerrit Maritz, Piet Retief and Andries Pretorius. 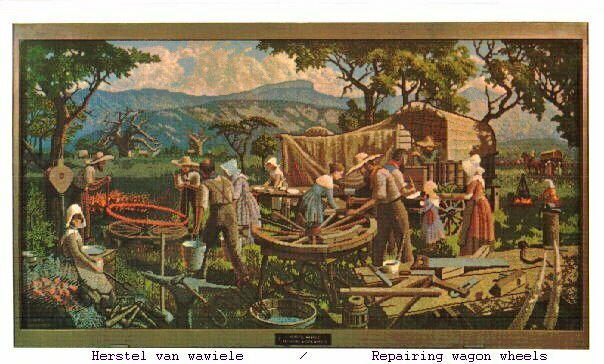 The Voortrekkers mainly came from the farming community of the Eastern Cape although some such as Piet Retief originally came from the Western Cape farming community while others such as Gerrit Maritz were successful tradesmen in the frontier towns. 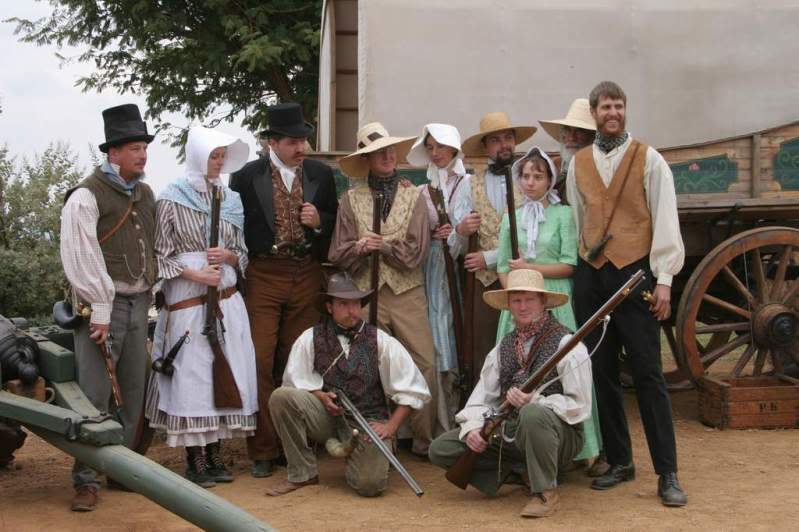 Some of them were wealthy men though most were not as they were from the poorer communities of the frontier. It was recorded that the 33 Voortrekker families at the Battle of Vegkop lost 100 horses, between 4,000 and 7,000 cattle, and between 40,000 and 50,000 sheep.These figures appear greatly exaggerated. Other members of the trekking parties were of Trekboer stock who came from a life of semi nomadic herding; yet others were employees, many of whom had been slaves only a few years earlier. The reasons for the mass emigration from the Cape Colony have been much discussed over the years. Afrikaner historiography has emphasized the hardships endured by the frontier farmers which they blamed on British policies of pacifying the Xhosa tribes. Other historians have emphasized the harshness of the life in the Eastern Cape which suffered one of its regular periods of drought in the early 1830s compared to the attractions of the fertile country of Natal, the Orange Free State and the Transvaal. Growing land shortages have also been cited as a contributing factor. The true reasons were obviously very complex and certainly consisted of both "push" factors including the general dissatisfaction of life under British rule and "pull" factors including the desire for a better life in better country. which activities enhanced the pressure placed on indigenous wildlife by pre-existing tribesmen, whose Bantu predecessors had previously initiated such grazing in the Waterberg region. These Voortrekkers arriving in the Waterberg area had believed they were in the Nile River area of Egypt based upon their understanding of the local topography. Andries Pretorius filled the leadership vacuum hoping to enter into negotiations for peace if Dingane would restore the land he had granted to Retief. When Dingane sent an impi armed force of around twelve thousand Zulu warriors to attack the local contingent of Voortrekkers in response, the Voortrekkers defended themselves at a battle at Nacome River called the Battle of Blood River on 16 December 1838 where the vastly outnumbered Voortrekker contingent defeated the Zulu warriors. This date has hence been known as the Day of the Vow as the Voortrekkers made a vow to God that they would honor the date if he were to deliver them from what they viewed as almost insurmountable odds. The victory of the besieged Voortrekkers at Nacome River was considered a turning point. The Natalia Republic was set up in 1839 but was annexed by Britain in 1843 whereupon most of the local Boers trekked further north joining other Voortrekkers who had established themselves in the region. Armed conflict, first with the Ndebele people under Mzilikazi in the area which was to become the Transvaal, then against the Zulus under Dingane, went the Voortrekkers' way, mostly because of their tactics, their horsemanship and the effectiveness of their muzzle-loading guns. This success led to the establishment of a number of small Boer republics, which slowly coalesced into the Orange Free State and the South African Republic. These two states would survive until their annexation in 1900 by United Kingdom during the Second Boer War. 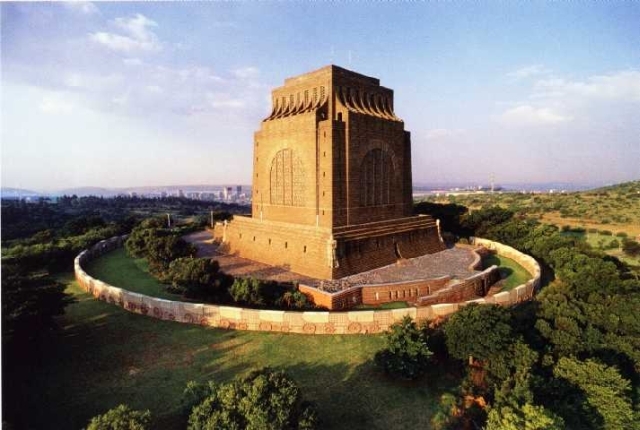 The Voortrekkers are commemorated by the Voortrekker Monument located on Monument Hill overlooking Pretoria, the erstwhile capital of the South African Republic and the current and historic administrative capital of the Republic of South Africa. Pretoria was named after the Voortrekker leader Andries Pretorius. 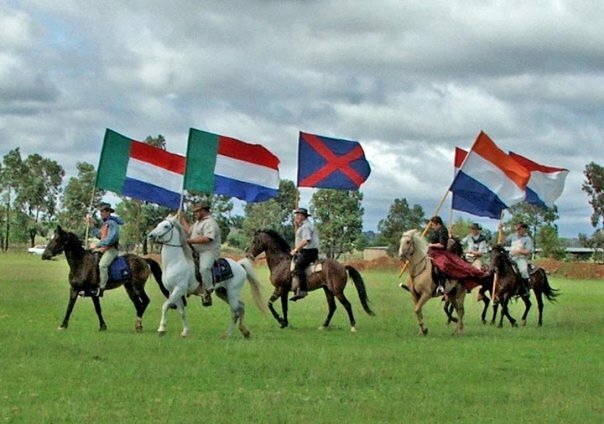 The Voortrekkers had a distinctive flag, used mainly by the Voortrekkers who followed Andries Hendrik Potgieter, which is why it was also known as the Potgieter Flag. This flag was used as the flag of the Zoutpansberg Republic until this republic was incorporated into the Transvaal Republic also known as the South African Republic. A version of this flag was used at Potchefstroom, one of the first independent Boer towns and republics established by local Voortrekkers. Louis Johannes Trigardt 1783–1838 from Swedish: trädgard, garden was a farmer from the Cape Colony's eastern frontier, who became an early voortrekker leader. Shunning colonial authority, he emigrated in 1834 to live among the Xhosa, before he crossed the Orange River into neutral territory. His northward trek, along with fellow trekker Hans van Rensburg, was commenced in 1836. He led his small party of emigrants into the uncharted interior of South Africa, and settled for a year at the base of the Zoutpansberg. At this most northerly point of their trek, unhealthy conditions began to take a toll on man and animal. Seemingly abandoned by a follow-up trek, and distant from supplies and buyers for their ivory, Tregardt abandoned the settlement, and led the party southeastwards to the Portuguese outpost at Delagoa bay. The oceanward route proved arduous and included the challenge of traversing a section of the northern Drakensberg. Though reaching the fort at Delagoa bay, a number of their party contracted malaria en route. Tregardt's wife perished at the fort in May 1838, followed by Tregardt six months afterward. Andries Hendrik Potgieter, known as Hendrik Potgieter 19 December 1792 - 16 December 1852, was a Voortrekker leader. He served as the first head of state of Potchefstroom from 1840 and 1845 and also as the first head of state of Zoutpansberg from 1845 to 1852. Andries Hendrik Potgieter, known as Hendrik Potgieter (19 December 1792 - 16 December 1852) was a Voortrekker leader. He served as the first head of state of Potchefstroom from 1840 and 1845 and also as the first head of state of Zoutpansberg from 1845 to 1852. Potgieter was born in the Tarkastad district of the Cape Colony, the second child of Petronella Margaretha and Hermanus Potgieter. He grew up to be a wealthy sheep farmer and fought in the Fourth and Fifth Frontier Wars. However, like many other Boers farmers of Dutch, French, and German descent living in the Cape Colony he decided to leave the colony in 1834. Delayed by the Sixth Frontier War, Potgieter and a group of Voortrekkers under his leadership left in 1835. Other treks under Louis Tregardt and Johannes Hendrik Janse van Rensburg had preceded him. The Voortrekkers' spiritual leader, Sarel Arnoldus Cilliers, later joined Potgieter's trek. Potgieter and his party moved inland to the present Free State, where they signed a treaty with the leader of the Barolong, Moroka. The treaty stipulated that Potgieter would protect the Baralong against the Matabele raiders, in exchange for land. The tract of land was from the Vet River to the Vaal River. The Matabele leader, Mzilikazi, was threatened by the white incursion into what he saw as his sphere of influence, which led to the Matabele's attack on the Potgieter laager in October, 1836, at Vegkop, near the present-day town of Heilbron. The attack was beaten off, but the Matabele made off with most of the trekker oxen, crucial draught animals for the wagons. The combined trek groups of Piet Retief and Gerrit Maritz came to Potgieter's rescue. Moroka also helped with oxen. His group joined up with Retief and Maritz at Thaba Nchu, where they formed a Voortrekker government and decided to move to Natal. Potgieter was not in favour of this plan and stayed behind in the Free State. Charl (Sarel) Arnoldus Cilliers 1801 – 1871 was a Voortrekker leader and a preacher. With Andries Pretorius, he led the Boers to a huge victory over the Zulus at the Battle of Blood River in 1838. In particular, Cilliers lead the Voortrekkers in a vow which promised that if God would protect them and deliver the enemy into their hands, they would build a church and commemorate the day of their victory as if it were an annual Sabbath day, which their descendants would also be instructed to honour. He was a prominent member of the Gereformeerde Kerk Reformed Church, an offshoot of the Dutch Reformed Church. He is described as being a short, stout man, and was believed to have been very religious. He joined the Great Trek at the age of thirty five. The town of Kroonstad was, according to folklore, named after a horse belonging to Cilliers, which drowned in a stream Kroonspruit where the town is situated. There is a Sarel Cilliers Museum as well as a statue of him on the site of the Dutch Reformed Church in Kroonstad. Numerous streets and roads in Kroonstad and throughout South Africa are named after him. In 1829, the Cilliers family moved to New Hantam today Colesberg. In 1835, a drought hit the local area, and this led to Cilliers joining the Great Trek with his wife and six children in 1836, as he was convinced that it was God's will that he should go. Cilliers was made the unofficial pastor of the Great Trek, and he would hold services on a daily basis and give Sunday Communion. During the Great Trek he became distinguished as a spiritual leader, earning him such names as The Prophet of the Great Trek and The Father of Dingaansdag (Dingane's Day). In 1837, he was appointed to one of the two deacons of the first church council elected in the commissioned commandos. Renowned for his ability of boosting the morale of members of the Great Trek during times of hardship, he would often inspire troops through his recital of the Lord's Prayer during conflict. His skills of fortifying the troops were best displayed at the Battle of Blood River, where he spoke the famous vow to God on the battlefield, and held a thanksgiving service after the decisive victory over the Zulus. Cilliers' vow was celebrated as a national holiday in South Africa Day of the Vow on December 16 until 1994. Petrus Lafras Uys more commonly known as Piet Uys ,1797 - 1838 was a Voortrekker leader during the Great Trek. He was born in Swellendam, the third son of six of Jacobus Johannes Uys nicknamed Koos Bybel (Bible) because of his religious beliefs. In 1823 Piet Uys moved to a farm in the Humansdorp area near Uitenhage together with his father. Uys married a cousin, Alida Maria Uys, in 1815. The couple had three sons. He was described as a "well-spoken, intelligent man" with a wide circle of friends, including the Governor of the Cape Colony, Sir Benjamin d'Urban and Colonel Harry Smith. His conduct during the Cape Frontier wars led him to assume a leadership role at the relatively young age of 37. As a result of this, Uys was chosen to lead the "Commission Trek" to Natal in 1834, where he visited Port Natal and may also have met Dingane. After this successful scouting expedition, the party returned to Uitenhage in February 1835. The subsequent favourable reports of the Commission Treks resulted in many farmers leaving their farms and trekking into the interior of Southern Africa, in what later became known as the Great Trek. Uys sold his own farm in December 1836 and left the Uitenhage area with his party of 100 Voortrekkers as they became known in April 1837. On 29 June of the same year, the Uys Trek arrived at the combined Voortrekker laager at the Sand River where, unbeknownst to them, Piet Retief had been elected Governor and a constitution drafted. Uys refused to accept either and insisted that, once they had reached Natal, democratic elections should be held. He also proposed a constitution based on that of the United States of America. Uys then received a request by Andries Potgieter to help him against the Matabeles and their leader, Mzilikazi, who had recently defeated him. A commando led by Uys responded, and their combined forces eventually drove the Matabeles into what is now the country of Zimbabwe, opening up the Highveld area for future settlement. On their return to the laager, the men found that Retief had already left for Natal. 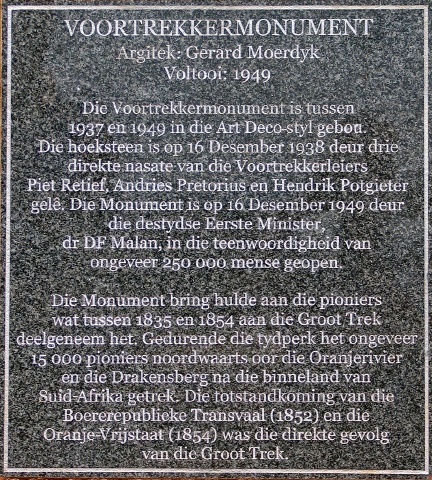 Uys and Potgieter subsequently travelled with a scouting party to Natal to visit Retief, but left for what later became known as the Orange Free State after being made to feel unwelcome. However, after the massacare of Retief and his men by Dingane and the subsequent Zulu attacks on the Voortrekker laagers in Natal, commandos led by Uys and Potgieter rode to their aid. During the subsequent Battle of Italeni both Uys and his second son, Dirkie, were killed. Uys was to be the only Voortrekker leader to be killed in battle during the Great Trek. Soon afterward ensued the Battle of Blood River. 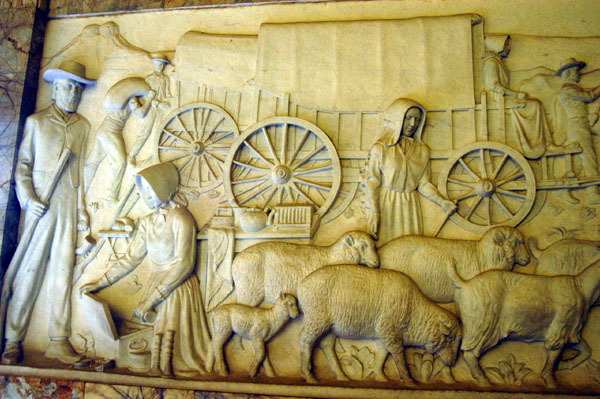 Uys and his son Dirkie are remembered in the Voortrekker Monument. Graaff-Reinet: Gerrit Maritz, Great Trek Leader after whom Pietermaritzburg was partly named was a wagon-maker in the town. Pietermaritzburg: There exist two interpretations about the origin of the city's name. One is that it was named after Piet Retief and Gerrit Maritz, two famous Voortrekker leaders. Pieter Mauritz Retief 12 November 1780 – 6 February 1838 was a South African Boer leader. Settling in 1814 in the frontier region of the Cape Colony, he assumed command of punitive expeditions in response to raiding parties from the adjacent Xhosa territory. He became a spokesperson for the frontier farmers who voiced their discontent, and wrote the Voortrekkers' declaration at their departure from the colony. He was a leading figure during their Great Trek, and at one stage their elected governor. He proposed Natal as the final destination of their migration and selected a location for its future capital, later named Pietermaritzburg. Following the massacre of Retief and his delegation by Zulu king Dingane, the short-lived Boer republic Natalia suffered from ineffective government and succumbed to British annexation. Retief's household departed in two wagons from his farm in the Winterberg District in early February 1837 and joined a party of 30 other wagons. The pioneers crossed the Orange River into independent territory. When several parties on the Great Trek converged at the Vet River, Retief was elected "Governor of the United Laagers" and head of "The Free Province of New Holland in South East Africa." This coalition was very short-lived, and Retief became the lone leader of the group moving east. 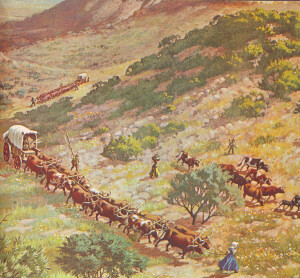 On 5 October 1837 Retief established a camp of 54 wagons at Kerkenberg near the Drakensberg ridge. He proceeded on horseback the next day, accompanied by fourteen men with four wagons, to explore the region between the Drakensberg and Port Natal, now known as kwaZulu Natal. He returned a message to the camp on 2 November, announcing to laager that they may enter Natal.Due to his favourable impression of the region, Retief started negotiations for land with the Zulu king Dingane kaSenzangakhona known as Dingane in November 1837. After Retief led his band over the Drakensberg Mountains, he convinced Voortrekker leaders Gerrit Maritz and Andries Hendrik Potgieter to join him in January 1838. On Retief's second visit to Dingane, the Zulu agreed to Boer settlement in Natal, provided that the Boer delegation recover cattle stolen by the rival Tlokwa nation. This the Boers did, their reputation and rifles cowing the people into handing over some 7,000 head of cattle. Andries Wilhelmus Jacobus Pretorius 27 November 1798 – 23 July 1853, was a leader of the Boers who was instrumental in the creation of the Transvaal Republic, as well as the earlier but short lived Natalia Republic, in present day South Africa. Discontented under British rule, he left his home and joined the Great Trek to the north. By way of the Orange Free State, he crossed the Drakensberg into Natal, arriving in November 1838, when the emigrants lacked a recognized leader following the death of Piet Retief in February. They chose Pretorius as commandant-general, and he quickly collected a force to avenge the deaths of Piet Retief and his party, who had been killed by the Zulu king Dingane's forces in February under treacherous circumstances. On 16 December 1838, Pretorius' force of some 500 men was attacked by over 10,000 Zulus. With superior weaponry and tactics, the Afrikaners beat them off, killing an estimated 3,000 warriors in what became known as the Battle of Blood River. 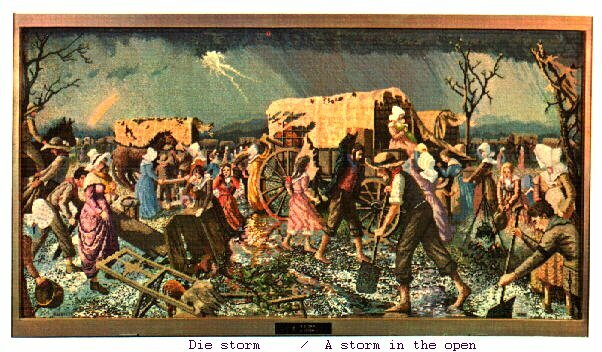 Afrikaners memorialized the day as "Dingane's Day" until 1910. It was renamed "Day of the Vow", later "Day of the Covenant", and made a public holiday by the first South African government. After the fall of apartheid in 1994, the new government kept the day as a public holiday as an act of conciliation to Afrikaners, but renamed it "Day of Reconciliation". In January 1840, Pretorius with a commando of 400 burghers, helped Mpande in his revolt against his half-brother Dingane. He was also the leader of the Natal Boers in their opposition to the British. In 1842, Pretorius besieged the small British garrison at Durban, but retreated to Pietermaritzburg on the arrival of reinforcements under Colonel Josias Cloete. Afterward, he exerted his influence with the Boers to reach a peaceful solution with the British, who annexed Natalia. Remaining in Natal as a British subject, in 1847 Pretorius was chosen by the Boer farmers to present their grievances to the governor of Cape Colony. They were concerned about the continuous migration of natives who were assigned locations to the detriment of Boer land claims. Pretorius went to Grahamstown to seek an audience with the governor, Sir Henry Pottinger, but he refused to see Pretorius or receive any communication from him. 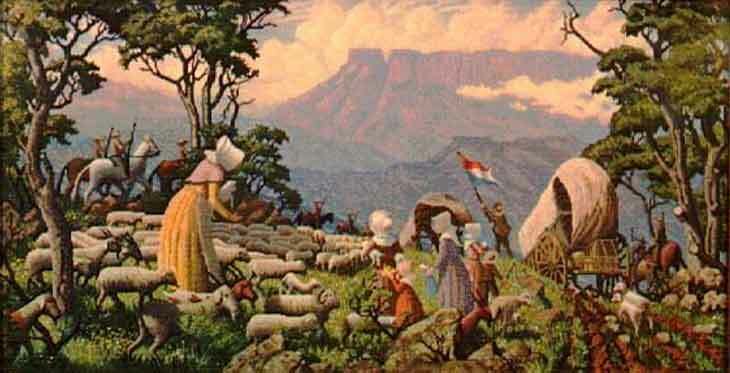 Pretorius returned to Natal determined to abandon his farm and move beyond the British dominions. In 1851, Boer malcontents in the Orange River Sovereignty and the Basotho chief Moshoeshoe I asked Pretorius to come to their aid. He announced his intention of crossing the Vaal to "restore order" in the Sovereignty. His goal was to obtain an acknowledgment of the independence of the Transvaal Boers from the British. Having decided on a policy of abandonment, the British cabinet entertained his proposal. The government withdrew its reward of 2000 pounds, which had been offered for his capture after the Boomplaats battle. Pretorius met the British commissioners near the Sand River. On 17 January 1852 they concluded the convention by which the independence of the Transvaal Boers was recognized by Britain. Pretorius recrossed the Vaal River, and on 16 March he reconciled with Potgieter at Rustenburg. The followers of both leaders approved the convention, although the Potgieter party was not represented. In the same year, Pretorius paid a visit to Durban with the object of opening up trade between Natal and the new republic. In 1852, he also attempted to close the road to the interior through Bechuanaland and sent a commando to the western border against Sechele. Pretorius died at his home at Magaliesberg in July 1853. He is described by Theal as "the ablest leader and most perfect representative of the Emigrant Farmers." In 1855, a new district and a new town were formed out of the Potchefstroom and Rustenburg districts by his son, Marthinus Wessel Pretorius, who named them Pretoria in honour of the late commandant-general. Marthinus Wessel Pretorius was the first president of the Transvaal Republic.